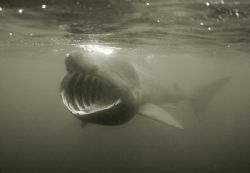 Basking shark swimming in the English Channel. D200 in Sea & Sea housing. Available light. 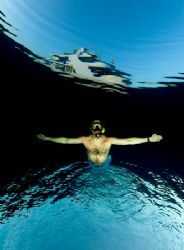 Taken while snorkelling. 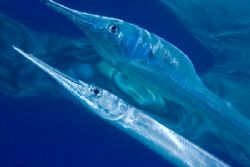 Needlefish swimming just under the surface on Jackson Reef, off Sharm el Sheikh. D200 in Sea & Sea housing. Composite image (really !). The 2 images were taken in Sharm el Sheikh in the evening. D200 in Sea & Sea housing and 2 YS90 Auto strobes. 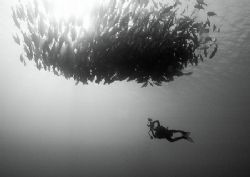 Underwater photographer at work in Ras Mohammed. D100 in Sea & Sea housing, no strobes. Converted to B&W in Photoshop. 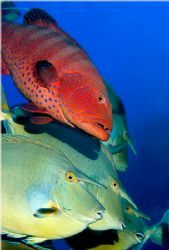 Grouper and Unicornfish, taken in Ras Mohammed last June. D100 with 2 YS90 strobes. 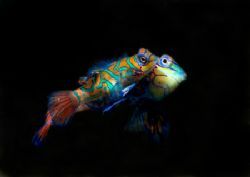 Mating mandarin fish taken at dusk on Paradise dive site in Mabul. Super behavior shot Jean-Philippe. Could have cropped it closer?